Koi hobby, how to begin? There is much confusion, misunderstanding and ignorance on this subject. On my virtual wanderings around the world I encountered different styles of koi keeping. The British style, which tends to be as "natural" as possible. Large ponds, low fish load, and oversized filters. Not to mention, a dislike of adding chemicals. Using this style in the exreme can be done by putting 1 fish per 5 cubic metres, even larger filters, and high temperature stability. That keeping fish alive and well under these conditions requires little artificial help is only logical. This can be very good when aiming to grow and keep very high quality showkoi, however the very large number of koihobbyists do not have the means to do this. Then the other side of the world, the Far East, especially Malaysia and Singapore. A completely different style of keeping koi. Small ponds and (seemingly to us) extremely high stocking rates. 5 koi per cubic meter is no exception. It goes without saying that keeping healthy koi in such environments is an art, and that the smallest error will be punished without merci. Higher temperatures, and the fact that fresh water without nasty additives is not as given as it is in The Netherlands. It is clear that keeping koi without artificial help is difficult, if not impossible. We can learn a lot from these people. Than the USA, where a real rocket scientist sometimes has some extra fish in his pond, and sees no problemin treating his pond weekly with potassium permanganate. For him there is no other way to keep his overpopulated pond free from diseases. The most pleasant surprise came when I found the site Roark. An enthusiastic person with a great amount of knowledge. The FAQ I was planning to write was already on his site, and more than that, I met none other than the inventor of the H2O2-reversal. A method to transform a pond after FP treatment back to a crystal clear pond within minutes. Permission to translate the FAQ was obtained, and even encouraged. This made it possible to create this document. A visit to his No_Nonsense_Koi_Keeping site is also very rewarding: www.click2roark.com. This site has disappeared from the web. To be clear, my words are in italics (this font) to indicate where his words stop and mine begin. Read this FAQ several times through. Things that are not initially apparent will later become clear as will your pond. Besides the risks potassium permanganate is a sledgehammer that does a great job at killing the known external pathogens. You do not have to be afraid, but you should also not use it as a remedy for all diseases in the pond. It is a tool, and like any other tool should be understood to be used the right way. With this in mind, here is an attempt to a FAQ sheet to explain how it works, how to use it safely, and what to do in emergency situations when you've screwed up. Okay, what is this stuff? 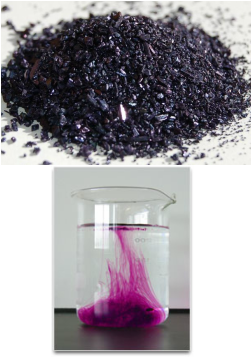 Potassium permanganate KMnO4 is a kaustisch alkaline that destroyes organic materials through direct oxidation. Contrary to popular opinion, it is only sparingly soluble in water. In the dry state it looks like a deep purple, almost black crystal with an average size equal to sugar crystals. Dissolved in water it will cause a deep purple color and it is available in different purities. KMnO4 is a useful treatment against most types of parasites in a pond. It is clearly not suitable as a treatment for carp lice (Argulus) and anchor worm (Lernea), although experience shows that the amount of secondary invaders which these parasites entail is greatly reduced. KMnO4 is also used experimentally against (wire) algae. An important application lies in the reduction of all dead and living organic microbiology known as DOC (Dissolved Organic carbonates). Accumulation of this DOC will eventually lead to deterioration of water quality and to an increase of pathogens. KMnO4 (henceforth PP), unlike malachite does not contain toxic components that can accumalate in the fish, its use is permitted in fish farms for human consumption. Is it dangerous for me? It can be very dangerous if used carelessly. It can injure, blind, and even kill you, it is important to understand that it is an extremely powerful oxidant, and reacts violently with glycol, glycerin and hydrocarbons in general. You can perform an experiment to see how powerful this stuff is by putting a half teaspoon KP on a dry flat rock, and gently add a drop of brake fluid. Stay upwind and keep enough distance. Note the spontaneous flame, and remember this well. This experiment should be performed, preferably with gloves and safety glasses. Now that I have scrared you a bit, settle down, relax and read on. As most chemicals, KP has its bad and good sides. Once in the water at the recommended concentration it is not as reactive anymore. It is even an old remedy against intestinal parasites in humans in past times. In third world countries it is still used to prevent infection of diper rash. PP is an amazing and very useful tool. What are the effects on the skin? PP kills the skin, and will stain it dark brown for several days. It can also cause permanent whitening of dark colored skin if exposed to a high concentration. It will burn skin in the same manner as concentrated acid. It does not contain carcinogenic or toxic substances. So use gloves. What are the effects on my respiratory system? PP is a highly irritant. Get a bit in the nose and you have the grandmother of allergy attacks. Roark has experienced the most amazing 20 minutes of his life at the pond edge, sneezing his brain out. Get into the lungs and you will be on artificial respiration for a few weeks. The use of an inexpensive dust mask gives good protection, and is strongly recommended. What is the effect on my eyes? Disastrous. Here, special attention is a must. PP is able to cause permanent blindness, and not much is needed to cause this. It can be caused by a splash of concentrated solution, or by a dust particle thereof in the eye. Seconds count where the eyes are concerned. Try not to get to a tap or hose (unless at hand), but stick your head in the pond, and keep your eyes open. Call for help and dive again. The highest priority is to stay wet, even if you just dosed the pond with a 4 ppm concentration of PP, you're still better off with pond water than losing important seconds to get to running water. You will probably suffer from the worst eye infection thats has ever been encountered but at least you will retain your sight. The use of safety goggles when mixing and dosing of PP is strongly recommended. What are the effects on the digestive system? PP is a nightmare if ingested in any amount. Although it is not likely that there is a life threatening situation if you are near a hospital, you will, for a few days, wish you were dead. Rinse the stuff as much as possible from the mouth, and drink a large amount of milk. Then make sure that you get first aid. You will feel terrible, and will never make the same mistake again. (milk contains many organic substances which will react with the PP immediately. By taking large quantities of milk you ensure that the oxidating energy PP is spent on something else than your stomach. Do I need medical attention if I've been exposed to it? Matter of common sense. Is there a little coloration of the skin, then there is no reason to panic. On contact with eyes or mouth, I would definitely make sure I got medical help soon after rinsing and cleaning as much as possible. Is it harmful to my plants? No, actually find the plants the manganese component to be a delicacy. As long as you do not use undissolved powder directly on the plants, there is nothing to worry about. A 20-40 ppm solution is an excellent decontamination bath for new plants before placing in a pond. Get some circulation, and dip the whole plant in the solution. After about 6 hours, the plant is completely free of snails, bacteria, parasites, and other evil stuff. Is it harmful to other pond equipment? Is it harmful for my biofilter? YES! All bacteria that come into contact will be dead. PP loves organic materials, and that is exactly what your carefully cultivated bacteria in the biological stage of your filter consists of. During treatment it is best to shortcut the filter and have it run on its own. A small (spare) pump is useful for this. If you can provide additional aeration do so, however you koi pond needs additional aeration also and make sure the latter has enough of it! Aeration is the key to long-term survival of biofilters for treatment (6-8 hours). Is it harmful to my fish? Depends. If you can accurately weigh the PP, and you know the pond contend within a 10% margin, then the use of PP is almost without risk. People who are carefree, not accurately weigh, or roughly estimate the pond volume, or think "the more the better", will be better off with other medication. KP does not tolerate idiots, and will cause a massacre when overdosed! A separate note on sturgeon, these fish need a lot of oxygen, so if no other option is available then: aeration, aeration and aeration. A few hours before, during, and for several hours after the treatment! The dosage for a pond with sturgeon should not exceed 1.5 ppm! Even with this low dose I have sadly experienced a death of a (before treatment) healty sturgeon so now I always first transfer the sturgeon from my koi pond to my quarantine pond for the 6 hours needed. - Never dose a pond where the fish already gasp for air. - Never dose a pond with insufficient aeration. - Never dose a pond with inadequate circulation. - Never dose a pond if the water volume is not accurately known. - Never dose a pond with an unweighted or estimated quantity PP. - Never dose a pond that you cannot attend to the next 8 hours. - Never dose a pond with weed algae during the afternoon or evening. - Never dose a pond that had recent previous treatment with oxygen consuming medications such as formalin. - Make sure you can always weigh the exact dose. - Provide abundant aeration of the pond in the form of heavy air pumps, a spraybar, or a large venturi. - Provide for added aeration for 3 hours prior to treatment, during treatment, and for 12 to 18 hours after treatment. - Always provide sufficient NPC(potassium percarbonate) to treat the entire pond 2 times. - Or; Always make sure that you have enough hydrogen peroxide on hand to treat the pond 2 times. - Make sure that there is always someone present, during and after dosing to monitor the condition of the fish. What is meant by the term ppm? That means: Parts Per Million. which is equivalent to milligrams per liter, or grams per cubic meter. A pond of 10 cubic meters you want to dose with 3 ppm PP requires a quantity of 30 grams. For normal ponds (2 cubic meters or more) the amount of PP can just be weighed. For smaller ponds or aquaria, this is a (too) accurate job. It is better then to make a fixed dilution solution and keep that in stock in a very secure place. Make sure the crystals are completely dissolved. Use warm water. PP has an unlimited shelf life and can not spoil. How high should I dose? Good question. The answer varies per pond and per owner. PP, is effective at a dose of 1 ppm, and this(even for beginners) is considered a safe dose, provided that all recommendations in this FAQ are met. With this dose, there is no possibility to damage anything except a few parasitic. Unfortunately this minimum dose is not able to kill some of the tougher pathogens, nevertheless I would recommend beginners to stay here to start unless a massive fish mortality due to parasites, requires a higher dose. The latter is at the expense of the safety margin. PP will only "really" work as a broad spectrum parasite killer when dosed at the 2 ppm to 3 ppm range. This dose has a low risk for beginners, but is still perfectly safe in the hands of the more experienced pond owners. Beginners are strongly advised to not use this dose before gaining more experience. Aeration (or lack thereof) makes the difference whether the treatment kills the fish or the parasites. At a 4 ppm level PP is an absolute hammer. In a short time you can get a impressive parasites / bacteria death toll. This dose is an absolute risk, and creates massive fish death when you try to take a shortcut, or if unexpected problems arise, or if you treat already weakened fish. Highly experienced people use this dose routinely, but there is no room for error, you should have your act together tightly, and keep a sharp eye during the course of treatment. Beginners very simply DO NOT GO HERE! 5-6 PPM is a red zone. This dose is only used when a very nasty parasite kills your fish in truckloads. Please note that the fish will have gill damage, and that the Doitsu species will live on with a slightly burnt skin! Rather stay far away from this dosage. The 20 ppm dose is absolutely lethal to all fish and other aquatic life and will be so within a few minutes. This is known as a sterilization dose and is only used on plants or ponds without fish. This dose should not be used on fish, not even a short dip. The author of this FAQ has experimented a lot on baitfish, and has experienced that this method is both disappointing in killing parasites but will damage the gills of the fish. Do not use PP for a dip! 1. Thou shalt know the pond volume within a 10% margin exactly. 2. Thou shalt accurately weigh a dose. 3. Thou shalt use a spraybar. 4. Thou shalt keep all biological filter media outside the treatment. 5. Thou shalt have truckloads of NPC and hydrogen peroxide at hand. 6. Thou shalt never leave a PP treatment unattended. 7. Thou shalt never "estimate" a dose. 8. Thou shalt protect the eyes, mouth and hands. 9. Thou shalt have an emergency plan in place in case something goes wrong. How do I add PP to the pond? Pond is purple during proper treatment. Brown needs retreatment. The PP solution should be distributed as evenly as possible across the pond to avoid high dose clouds. This is more critical as the dose goes up. Some people still believe that a fish can swim through a cloud of highly concentrated PP without gill damage. Biopsy has clearly demonstrated the opposite. When in doubt, dose slowly. There is no reason to hurry. The biggest mistake you can make is directly dump a load PP crystals in the pond, expecting that this will spontaneously dissolve in the water. Another error is solving the dose in a large bucket and then chuck it into the pond. I can assure you that a fish swimming through a 100 ppm cloud will have gill damage. Also understand that PP-crystals dissolve poorly in water. You must first be convinced that it will go into solution. This means stirring, shaking, etc. Translator's note: Take a container and fill it half with hot water, add the PP and close it tightl. Now the solution can be shaken considerably without danger of highly concentrated splashes going everywere. Once you are convinced that the PP is completely dissolved, it can be added to the pond. The spraybar will provide a good safe distribution in the pond. This is the best method, while ensuring proper dissemination and aeration. Do I have to monitor the pond continously? The answer is a very loud YES! So do not dispense and go, or you run the risk of a dead fish. At the least, the first few times the fish welfare should be checked every fifteen minutes. If you see the fish gasping at the surface, or float on its side, then you have a problem and you should stop the treatment immediately. Remember that fish with parasites can jump, flash, scrape, and in general can turn it into a complete show. This is normal. When the parasites realize that their end has come, they get very upset. They want to dig deeper, while the fish very much wants to get rid of those guys, and is willing to lend a hand. A pond full of itchy fish during a PP-treatment is a positive sign that you indeed have parasites. What about the duration and strength of the dosage? The optimal duration of a PP-treatment is between 4 and 12 hours. When you have fish that are weak and close to the edge you will want a mild and short first treatment. If you have fish that are full of parasites while showing healthy behavior, you can do the treatment over a full eight hours. If you're out on the removal of all organic load, and all life forms outside the fish, then an initial dose of 4 ppm with later a re-dosing of 2 ppm for the full 12 hours will work well. A wide variety of dosing styles can be used. Are there any possible deviations possible? Yes, some dose 4 ppm and let it go for 3-4 hours. Others dose 2 ppm and maintain that dosage level for 8 hours by re-dosing. Either option has its advantages, but there is one important statement that should be made here: You can exchange a stronger / short dose for a weaker / longer dose, and kill just as many parasites AND have less stress caused to the fish. In general, I advise beginners to use the weaker / longer protocol. (2 ppm for 8 hours). - You want a quick knockout of a rapidly spreading parasite population. - You need to neutralize toxin (pesticides, etc.). - You want a snail population reduction (snails may be resistant to PP below 3-4 ppm). - You have a high level of dissolved organic matter in the pond. - You want to remove Dechlorinator remnants. - You are confronted with a very resistant type of skin parasites. What is the dosage schedule? As well as the strength of the first dose, the redose over more days is also variable, depending on the condition of the fish. Some dose daily, while others prefer to dose every other day. Others tell you that every third or fourth day is optimal. These schemes are all valid. Some parasites die quickly using a short and hard dosing, while others are better able to withstand this and need a longer period of time in the active PP. Other parasites die with the first dose, but have intact eggs which hatch after one week. It all depends on what pest you want to control. Can you give me a general dosing protocol? Day 1: Dispense 2-3 ppm (depending on your experience level). re dose if the water is brown within 6 hours. DO not destain after the treatment. Resume filtering after the water is brown. (Absolutely no more pink color). Day 2: Dispense 2-3 ppm, re dose if the water is brown within 6 hours. Destain the water with hydrogen peroxide (H2O2), 52 ml / m³ or NPC. Resume filtering after the water has become clear. Day 5: Dispense 2-3 ppm. re dose if the water is brown within 6 hours. Destain the water with 52 ml / m³ hydrogen peroxide or NPC. Resume filtering when the water has clarified. Day 8: Dispense 2-3 ppm. re dose if the water is brown within 6 hours. Decolorization with hydrogen peroxide or NPC, and resume filtering. After the initial dose, the color can turn yellow / brown before the required 6 hours has passed. In this case one can re dose 1 or 2 ppm. You can redose a maximum of three times that day. If the water still has not turned purple / pink color after the third re dose, do not redose more dat day. If this occurs a second day in a row you can assume that something is wrong. Remaining Dechlorinator is usually the cause. Activated carbon in the filter will take care of that. Determining the time for safe redose is not yet clear to me. If in doubt, wait .. I've heard that it is wise to dose PP at nighttime? Nocturnal dosing has a small advantage over daylight. PP is sensitive to light to a small degree when in solution. If you have 2 identical ponds at night and daytime dosing then the pond in the dark will be a little longer active, but the effect is only slight. PP is cheap stuff. If it needs to be reactive a littlebit longer, just add a small re dose. For safety reasons, I would strongly advise against nocturnal dosing. During the day you can see the state of the fish a lot better. It is hard enough to net a fish during a treatment in daytime, you can forget to try this at night. Is there a minimum dose temperature? No, PP works well, even in very cold water, in fact, the colder the water thesafer for the fish, simply by the increased ability of cold water to hold more dissolved oxygen. For practical reasons it is better not to use high doses below 12 degrees Celsius. This is not an absolute law, but the caustic effects on the mucous membrane of the fish should be considered. Go for a lower dose (2 ppm) unless you have a very important reason to go higher. There is a small risk that a very cold fish is no longer able to regenarate the mucus layer in this way can become a target for a small number of bacteria and parasites that survive in cold water. This is a small risk though. Can I leave on my UVC during treatment? You can, but you do not want to. The UVC emits very short wave UV light, and this will quickly neutralize the PP. This will result in a shortening of the period that PP will be active. In addition, you want to keep the UVC (enabled or disabled) entirely outside the treatment for the following reason: The manganese salts, a residual product of a KP-treatment (yes, that brown stuff), will form a thin film around the quartz tube of the UVC. This film will block the UV more than the normal organic substances in the pond, and that is why a UVC that has done tis job before a PP treatment, suddenly fails after treatment. So beside the filter, the UVC also should have a bypass. How do I clear the water after PP treatment? I got really tired of the water changes after PP treatment and have therefore invented the following trick: After the pink color of the water is gone, you can add 52 cc per cubic meter of 3% aqueous hydrogen peroxide (H2O2) to the water. Within minutes you can see the water clear up (NPC does the same). A dramatic change can be seen after one hour and 12 to 24 hours later, hte most crystal clear water you have ever seen sparkles in your pond. If some color still remains, you may add a second similar dose of hydrogen peroxide. The partial water change which was previously needed after a PP-party is no longer required. My fish are itching and flash constantly! As long as you have dosed correctly, there is no reason to panic. This is just a confirmation that you have a truckload of parasites on the fish. These parasites are strugling to their deaths and this irritates the fish. Do not be surprised if they jump into the air, or against the pond wall, or barn against stones. It's just part of the deal. My fish is gasping for air at the surface! Do not panic. Are they really taking a breath of air, or are they looking for food? I ask this question for the following reason: PP treatments take a huge amount of light from the pond. The fish experience a sunset, and since they have seen you wandering around the pond, they come to the surface because they want to eat! How do you tell them the difference? Feed them a few pellets and see if they show interest. If they eat, then you have no problem. If they ignore it, look at the speed of the gill movement. If this is rapid and constant, and if they open the mouth fully with each gill movement, then you have an oxygen problem. Arrange for additional aeration, or stop the treatment with dechlorinizer followed by hydrogen peroxide or stop and destain with NPC. If the gill movement slowly and evenly, without the wide open mouth, then you have no problem. My fish are facing down on the bottom! Again, do not panic. Look at the fish. Are the fish in line with the nose in the current? Are gill movements slowly and evenly? Do they look like they are sleeping? Chances are they are. Three of my fish almost immediately go to their "power down mode". Again, this is about light influences. Less light makes them think it's bedtime. If you see fast gill movement, or if the fish simply do not look good, it is wise to stop the treatment and see what's bothering them. There is snot coming out of the gills! If they have parasites on the gills, then this is actually good news. The fish tries to get rid of the dying parasites. This is accompanied by mucus secretions. Keep a careful eye on the fish. If it is obvious that he is trying to get rid of the parasites, then let him have his way. If the fish is clearly in trouble, stop the treatment and then try the next day with a lower dose. My fish all have brown spots! The front of the pectoral fins. The front of the dorsal fin. An area the size of a coin just before the tail fin. A small area in the nostrils. The under arm area at the beginning of the breast fins. The beginning and the end of the sensing wires. These are the areas where parasites have been. The PP has oxidized the scum and stained them brown. Remember these areas well if you check for parasites the rest of the year, these areas are "bug" magnets. The brown spots will soon disappear, usually within 24 hours, and even faster when hydrogen peroxide is added to the water. What is that dirty brown foam on the surface? I call it "bug soup", it is organic junk that is blown to hell by the PP. It does not hurt the fish, and will disappear with time. The addition of peroxide lends a hand to get rid of it. If it bothers you, you can whack that foam down with a strong water ray, so that the filter can take care of it. I've read that PP and salt is a deadly combination! That is a myth. There is no reason why NaCl and KMnO4 cannot be used together. If you keep the salt dose below 0.6% and the PP below 4 ppm, then you have no problem. Note that these limits are common sense, and have nothing to do with any interaction between salt and PP. I've read that PP and peroxide together form a strong caustic! I have read it also and had a good laugh about it. I will not go too much into details, except to say that this is chemically impossible. I think someone killed a truckload of fish, and needed something to blame it on. It is such a laugher that I have devoted a separate alchemy document to it. I'm having trouble solving PP in water. The best way to get this stuff to solve is by boiling water, and then let it cool a minute (T = 90C). Then add the PP slowly and whilst stirring to the water. Note: Latex gloves and eye protection are obligated if you use this method. If you have the cheaper variants of PPs with potentially reactive impurities used, you have no idea what could happen when the crystals hit the water. Be prepared for a lot of splashing. All I have to mix is a metal bucket. Can I use it? NO, not if you value your fish, the bucket, and possibly your life. PP is a hellish oxidant. Metals like to be oxidized, so it is right from the start an abusive relationship. The moment you add PP to the bucket they will both solve (PP AND the bucket). If the bucket is galvanized, the toxic lead and zinc will be solved in the water in high speed. This stuff is very toxic to your fish. Use plastic, Teflon, or whatever, but not metal. How do I get that brown residue of my hands? Well ... (giegel!) ... If you would have followed the instructions in this document, you would have never had to deal with this problem. The natural way: cut a ripe orange or lemon in half and rub the brown spots with the juice. This works reasonably well, and your hands smell nice, you are also rid of the fishy smell. The chemical way: Wash hands with hot water until you get wrinkles. Add some 3% (not 30%!) Hydrogen peroxide on the brown spots, and scrub with an old toothbrush. This works very effectively, ..., but is not hand friendly. Guys might find it macho ... ladies will send me hate mail. The minimum / lazy way: Do nothing. It will wear off within 24 hours. If you have dark skin, then you might not notice the spots. If you're a white lily .... wear gloves, and look at everyone not wearing gloves like they are not aware of the latest fahion styles..
HELP! I HAVE OVERDOSED THE POTASSIUM PERMANGANATE! Hydrogen peroxide, 3%. 52 ml per cubic meter. Sodium thiosulfate crystals (or any commercial dechlorinisation). Here is the procedure to stop the PP treatment immediately, and rush the decolorization of the water. Step # 1: Stop the PP. Dose 4 - to 8 grams of sodium per cubic meter. This will immediately stop the PP treatment and neutralize. In emergency cases where large amounts of PP need to quickly be neutralized the above dose may be increased upto 5 times. It is even possible to still go up, but this is never really tested. In general, sodium thiosulfate is not toxic to fish. Theoretically, overdose of even 20 times should not cause serious damage. A quick response after a PP overdose is much more important than the accurate measurement of the dose of sodium thiosulfate. When you are confronted with the dilemma between accurate weighing and just dumping a volume in the pond, choose the latter. It is important that the first dose goes into the pond as soon as possible. Then you can estimate how much chucked in, and on that basis consider additional dosing. Also remember that good water circulation is as important as the strength of the dechloor dose. If the pond is not circulating enough :-( go for a higher dose, and do everything to keep the water in motion. Note: If you do not have sodium, use a commercially ontchloormiddel at the recommended dose. Inject the ontchloormiddel directly into the spraybar pump so that it is quickly distributed. If you do not have a spraybar, pour it as divided as possible into the pond. If you really in the mess, and do not have dechloor or NPC available (IDIOT!! ), Skip this step and go directly to step 2. Overdose rule: If you have dumped an unhealthy amount of PP in the pond, understand that for every 5 grams dose PP, you need 4 grams of sodium thiosulfate to neutralize the PP. When in doubt, add 25% extra too. Step # 2: destaining the resulting brown mess so you can estimate the damage immediately. Dispense 52 mL of 3% aqueous hydrogen peroxide (H2O2) per cubic meter. Also, this dose is best applied through the spraybar pump to the pond. A second, but worse method is throwing it around across the pond area with all pumps running. Note: It is important to understand that the above 52 ppm dose only contains 1.5 ppm active peroxide. Would you really dose 52 ppm active peroxide, then your fish and biofilter would be dead within 10 minutes. the dose mentioned can be multiplied by 3. Do not go beyond this triple dose, unless you are prepared to immediately catch the fish and place them in celan water. At higher doses this H2O2 will attack the gills, skin, fins, and eyes the same way as an overdose PP. Excessive dosage of hydrogen peroxide will kill the fish quickly. Here, too, water circulation is more important than the strength of the dose. Step # 3: Move the fish to fresh water. This step is unnecessary if you had a mild (<6 ppm) overdose, or if you have stopped a normal dose because there were fish in stress. Healthy fish will then recover, and usually there is no permanent damage. This step is very important if you had a heavy overdose. Here is why: You have burned the gills of the fish, and stripped the mucous membranes. These fish should be cared for anyway. In a heavy overdose you have put a truckload of manganese into the water. These manganese salts will also settle on damaged gills, causing more difficult oxygen exchange for the fish. I was recently at a local pond where the owner could successfully undo a severe overdose PP. The fish died one day later nevertheless. Autopsy showed some gill damage, but insufficient to be the cause of death... but there was a huge amount of brown mess stuck to the filaments, causing the fish to suffocate. The interesting fact about this case is that the 3 most stressed fish during overdose, were just scooped out of the pond and dumped into a kids tub just set up. These fish still live happily ever after.